Four T.J. Wheatley Floral Vases, Cincinnati, Ohio, c. 1880, a pair of bottle-form barbotine vases decorated with sprays of white roses, incised mark "1883," ht. 6 1/4; single bottle-form barbotine vase with branch of pink roses, incised mark "No. 83 T.J.W. Co.," ht. 7 1/2; and a barbotine vase with pink roses, incised mark "No. 3 T J.W. Co. 1882," ht. 5 1/2 in. 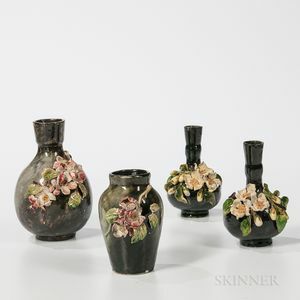 Pair of bottle-form vases with chips to floral elements and repair to one mouth. Single bottle with chips to floral elements. Vase with lose of floral elements.